535 pages | 259 B/W Illus. Helping you better understand the processes, instruments, and methods of aerosol spectroscopy, Fundamentals and Applications in Aerosol Spectroscopy provides an overview of the state of the art in this rapidly developing field. It covers fundamental aspects of aerosol spectroscopy, applications to atmospherically and astronomically relevant problems, and several aspects that need further research and development. Chapters in the book are arranged in order of decreasing wavelength of the light/electrons. The text starts with infrared spectroscopy, one of the most important aerosol characterization methods for laboratory studies, field measurements, remote sensing, and space missions. It then focuses on Raman spectroscopy for investigating aerosol processes in controlled laboratory studies and for analyzing environmental particles and atmospheric pollution. The next section discusses the use of cavity ring-down spectroscopy to measure light extinction, laser-induced fluorescence spectroscopy to identify and classify biological aerosol particles, and ultrafast laser techniques to improve the specificity of bioaerosol detection. The final section examines recent developments involving novel techniques based on UV, x-ray, and electron beam studies. 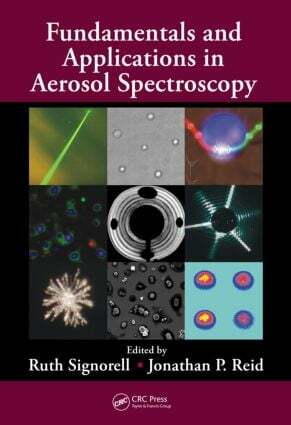 This book offers the first comprehensive overview of the spectroscopy of aerosols. It includes some results for the first time in the literature and presents a unique link between fundamental aspects and applications. Ruth Signorell is a professor in physical and analytical chemistry at the University of British Columbia. Dr. Signorell has been a recipient of the Werner Award from the Swiss Chemical Society, an A.P. Sloan Fellowship from the United States, the Thermo Fisher Scientific Spectroscopy Award from the Canadian Society for Analytical Sciences and Spectroscopy, and the Keith Laidler award from the Canadian Society for Chemistry. She earned her Ph.D. from ETH Zurich. Her research encompasses infrared and extreme ultraviolet studies of aerosols. Jonathan P. Reid is a professor in physical chemistry and a Leadership Fellow of the Engineering and Physical Sciences Research Council at the University of Bristol. Dr. Reid has been a recipient of the Harrison Memorial Prize and the Marlow Medal from the Royal Society of Chemistry. He earned his Ph.D. from the University of Oxford. His research focuses on developing new techniques to characterize and manipulate aerosol particles using light.